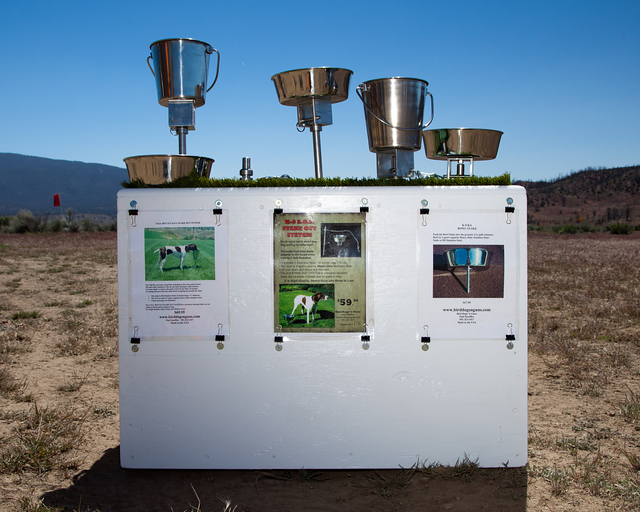 Our K-9 SOS is a tie out system with the water / food bowl or pail securely attached which is easily removable from the tie out stake. Choose from a pail or bowl style stainless steel food / water container. You can attach or remove the bowl or pail in less than 10 seconds. 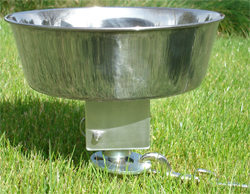 The bowl or pail locks onto the stake by pushing a release pin into position. The rotating disk prevents the chain from wrapping up around the stake. For more information on the K-9 SOS Stake Out System and directions click here. The stake is 304 Stainless Steel 18 inches long by x ¾ inch in diameter. 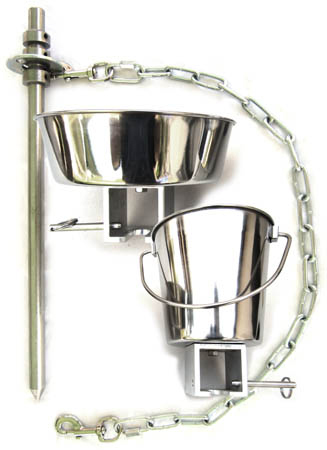 The bowl and pail are made of heavy duty stainless steel. Other components are fabricated from stainless steel, aluminum and corrosion resistant plated steel. The zinc plated chain is size 2/0 and is rated at 520 lbs. 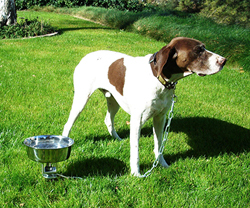 The K-9 STAKE OUT SYSTEM is corrosion resistant. There are no welds to break or paint to chip. High quality, heavy duty and made to last.